A practical, research-based, and classroom-proven way to study words with students. Included are prepared reproducible sorts and step-by-step directions on how to guide students through the sorting lesson, make literature connections, and follow-up activities to extend the lesson through weekly routines. Teachers will find it easy to use this guide as a complement to existing phonics, spelling, and reading curricula. Great strengths are the comparisons and contrasts between Spanish and English, the literature extensions, and the interim assessments…. I would adopt this book, and would recommend it to inservice teachers even if they are not in my courses. I think it fills a gap in material currently available to teachers. The book focuses specifically on the background knowledge and possible cross-linguistic confusions experienced by Spanish speaking students. Notes throughout the text help readers become aware of the most challenging sound and spelling patterns in English for students who speak Spanish. The pace and scope of the book is helpful for English learners from non-Spanish speaking backgrounds as well because it provides a focus on important, high-utility vocabulary; frequently uses pictures to teach new words; provides multiple opportunities to practice skills in a systematic manner; and gives the teacher control of how and when oddball words are introduced. Notes for the Teacher in each Unit provide placement guidelines and background information about the features of study. Introductory materials describe standard weekly routines. Directions show how to introduce the sort, along with additional teaching tips for each lesson. Reproducible black line masters allow for practice in sorting. Lori Helman is associate professor in literacy education in the Department of Curriculum and Instruction at the University of Minnesota. 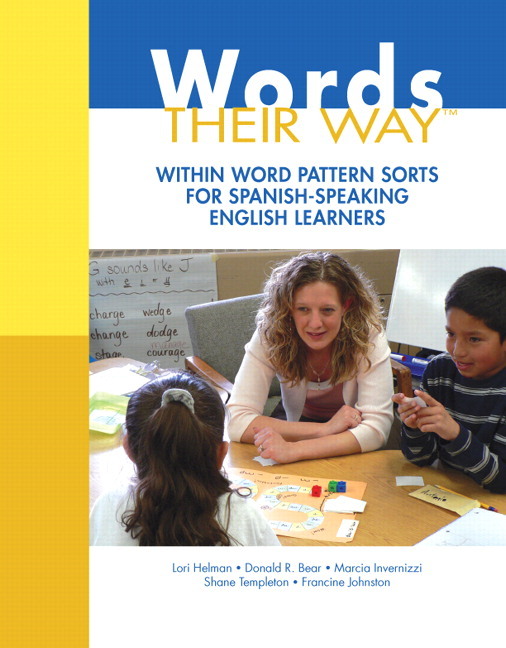 Her research and writing have focused extensively on the reading and spelling development of students learning English as a new language, including other Words Their Way® instructional materials for English learners.